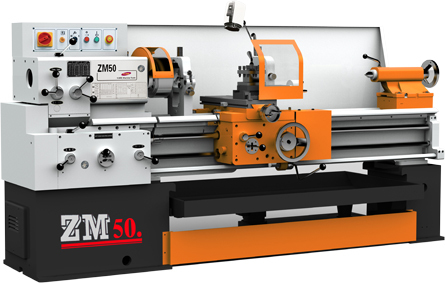 Engine lathe ZM series is backwards following European practice, which is the most regarded lathe in the world. The design meets the up-to-date demands of modern machining techniques. The large working capacity of the machine as well as the possibility of its being equipped with wide range of special attachments makes it a machine of universal application. This lathe enables nearly every kind of machining to be performed, i.e. Turning, boring, taper turning, spline and gear milling, etc. High degree of precision is ensured by the rigidity of all the main elements of the machine, i.e. The bed, headstock, tailstock and slides. These two essential properties, precision and rigidity, have been achieved by giving the machine the optimum shape and by employing the most convenient gear transmission system. Operation and servicing are as simple as possible. The external appearance of the machine satisfies the most exacting esthetic demands.